I followed the recipe quantities and size of container and this worked perfectly, but I wasn’t entirely satisfied with the design, so set about making some modifications. Major variations included, the use of replacement “vessels” from a standard IV cannulation task trainer arm. This was particularly good because they are self healing and also allowed for a trifurcation to create some anatomical variability in the model. The other major variation and one that certainly went down a treat with the registrars – I filled the vessels with simulated blood. Through some trial and error, I found that tying off the vessels and then injecting the blood solution into the closed system worked best to eliminate air completely and slightly pressurise the vessel, meaning, wait for it…. FLASHBACK. The flashback feature certainly got some excitement and enhanced the realism. So for a total cost of $7 per phantom (about 70 times less than the Blue Phantom trademarked trainer) we were able to produce a great and realistic ultrasound for difficult access session. The trainer copped about 100 cannulations and is still useable one week down the track. Echogenic tracks do form after repeated attempts and I would strongly advocate the metamucil/psyllium husk as it created “noise” in the gel and gave the impression of tissue. I also chose blue food colouring as it was darker and obscured the vessels. Update 4th May 2015 – Here is a link to another sweet recipe for a homemade UGIV simulator, complete with step by step guide and video from Jacob Avila @UltrasoundMD of 5 Minute Sono UGIV. I created a competency program for our USGPIV starts and I have made that phantom model as well. I struggled with the depth on my first two models but am on track now. I also haven’t found a good ‘vein’ material. 12 Fr foley was too tough and then I used long slender baloons filled with gelatin which were good but no flash. I lke the injecting after the factbut the balloon won’t tolerate that. I like the blue food coloring, my metamucil was orange so it was pretty well clouded but the blue looks good. Hi, where is it possible to acquire those replacement vessels to use instead of baloons or penrose drains? Can you get it online or only through a specialised materials distributor? Hi, thanks for stopping by the site. I would suggest http://www.simulaids.com/parts.htm they sell stand alone replacement parts. I just used old/discarded veins from an IV cannulation trainer arm. The veins had reached the end of their use in the trainer arm, but still had some viable sections to be re-sected for use in my USS trainer phantom. Hope this helps. Hey Jesse – great post last year re US phantoms. I’ve been experimenting myself last weekend. Think I have a recipe that works. Sorry for delayed response. 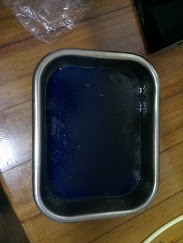 The gel lasted 1 week in refrigerator and was used to good effect across two training sessions. The trainer was punctured in excess of 200 times. There were definitely some echogenic tracks that developed over time, but all users commented on the quality and fidelity. Which for a cost of $7 plus the vessels, it was an incredibly cheap option. I saw this post by Jacob Avila @UltrasounMD on a nice looking homemade trainer too. Jacob uses ballistics gel. I’m not sure of the cost of this, but will probably look into it as it sounds like it lasts longer and can be re-melted and reused. Here is the link http://blog.5minsono.com/ugiv_sim/ 5 Minute Sono is a brilliant site too. Hi Jesse – thanks for the reply. 5minutesono seems like a great site and their recipe is based around the 10% ballistics gelatine. I’ve emailed Jacob Avila also. My mould is good but not strong enough. The kitchen is covered in blue dye though! First time, I am going to prepare ultrasound detecting phantom in my laboratory at CIDRF, Puducherry. This link give more information about how to prepare it in the simplest method. Thanks for the great feedback. 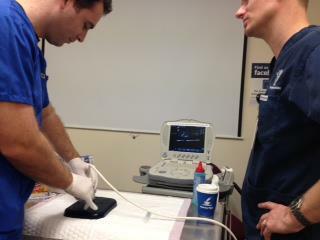 Good luck with the Ultrasound training!